Forklifts have been an indispensable equipment during various processes and manufacturing. Hydraulic operation becomes an important part of the forklift and the functionality. HyPneu can be used to determine the pump size, or even the cylinder size. In the example shown here, the tilt and lift cylinders were maximized to meet the required load capacity. 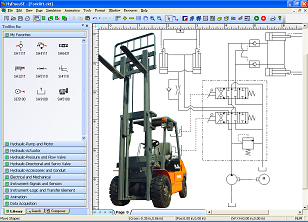 With HyPneu’s analysis the designer can determine and even correct the timing for lift and tilt. 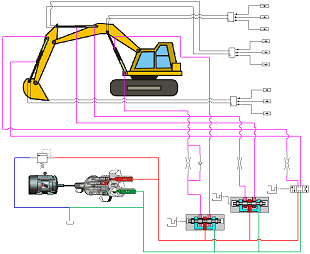 When designing machines or excavators, an important aspect to avoid is slow operation. It is essential that flow not be lost in a hydraulic system, because it will cause loss of speed. Utilizing HyPneu in the design will accurately size the components in your system. Designers will save time and frustration designing their system with our Component Manager, and will decrease unscheduled downtime and costly repairs on costly machines. HyPneu will also link up with third party motion packages. In a press, or hammer like function, speed is of primary concern. In most applications, the number of strokes is maximized. HyPneu can be used to design and determine the maximal amount of strokes the machine can handle due to the constraints on the hydraulic system. The return stroke can also be determined by HyPneu simulation. 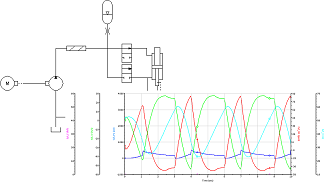 The designer can include other factors such as the control valve reaction time or add electronic circuits for control to represent the circuit realistically.